CT: Margaret, lovely to meet you! You are Chief Marketing Officer by day for a global agency, worlds apart from the fashion industry – firstly, where did your interest in fashion come from? MM: First and foremost, I’m a marketer. What do marketers do? We tell the stories of makers. We are keen observer of trends and consumer behavior. And we persuade others to act. Second, I have a deep appreciation for quality design, especially fashion. Third, as an Irish person abroad, I’m eager to give back to the Irish community in a way that is both meaningful and creative. CT: So, tell me a little more about the #WearingIrish campaign you launched? MM: I discovered an untold story and I’m sharing it now because it’s a story made for our time. Designers across the island of Ireland are producing world-class fashion, yet few people outside Ireland can name an Ireland-based designer. WearingIrish celebrates makers. WearingIrish recognizes provenance, authenticity, and quality. #WearingIrish began as a social media experiment in March 2016. Fast forward to today and WearingIrish is an online and offline platform that champions Irish fashion designers and their creations. MM: What’s changed from when you launched to now? MM: In January 2018, I set an ambitious goal for WearingIrish. Together with Bank of Ireland and the support of 5 other inspired sponsors—the Department of Foreign Affairs and Trade, through Ireland’s Consulate in New York, Tourism Ireland, CIE Tours, Invest Northern Ireland and Enterprise Ireland—we launched WearingIrish NYC 2018, a competition to find 8 top designers to bring to NYC to showcase their designs at Bank of Ireland startlab. The objective of the program is simple, to provide the designers access and exposure to the New York market. The winners will display their creations and meet consumers for a two-day, invitation-only event program to take place on May 15th – 17th. The program will include panels of speakers at salons hosted by various groups (e.g. Harvard Business School Women’s Association) as well as prominent members of the Irish diaspora. CT: With an incredible response to the Wearing Irish campaign, how did you narrow down to shortlist just 8 designers? MM: We were so overwhelmed by the caliber as well as the quantity, more than 170 applicants, that we decided to increase the award to 10 designers. The winning designers were selected by a panel of more than 25 jurors. CT: And who are the designers? MM: The ten winning designers are: Aine, Alison Conneely, Blaithin Ennis, De Bruir, Inner Island, Jennifer Rothwell, Nathalie B. Coleman, Sands and Hall, The Tweed Project and Triona. CT: Who was on the panel of judges? MM: The panel of jurors included current and former merchants, creative directors, executives, investors, editors, and influencers from Bloomingdale’s, Accessories Council, Victoria’s Secret, Stella & Dot, POPSUGAR, Theia, Keds, Kate Spade, Harvard University, Gilt Group, top Irish fashion editors and more. CT: In your eyes, what makes a designer unique? MM: A designer must have a point of view and that point of view most be woven into their creations. In the context of WearingIrish, the designs must play homage to Ireland in some way. CT: What unique techniques do Irish designers use that you’ve not really seen in the global market space today? MM: Their designs reflect Ireland’s tradition of making yet seek to interpret those traditions in a contemporary way. The result is clothing and accessories with a distinctive heritage and a very modern appeal. CT: How important is showcasing the Irish talent in US and why that location? MM: As a starting point, engaging the Irish diaspora in the U.S. is a natural goal for most Irish consumer brands. Millions or people in the US claim Irish heritage. Irish Americans are often keen to evoke their heritage and fashion is an untapped way for them to do so. Beyond that, New York is an attractive market for these designers to glean insights from shoppers on their products, pricing, and marketing to help assess the potential for their brand more broadly in the US. CT: What is your biggest accomplishment professionally and personally? MM: I earned an MBA from Harvard Business School. As a marketer and an immigrant to the US, that training, network, and credential continues to propel my career and my impact forward. While I’m not sure whether this is my biggest accomplishment, it’s certainly a useful one. CT: What’s next for the WearingIrish campaign? 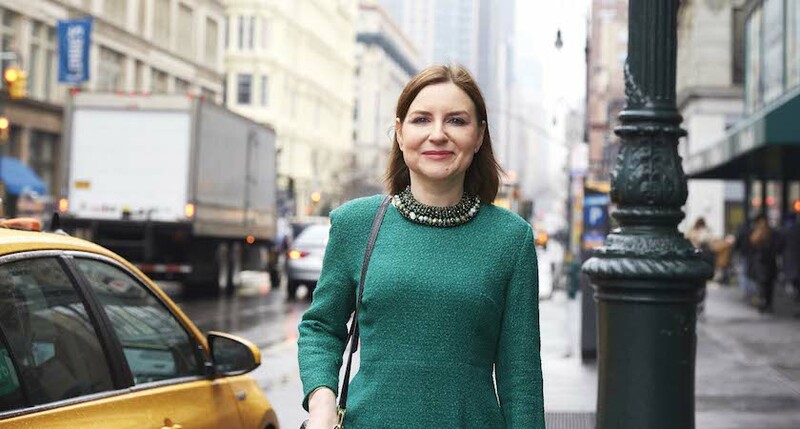 MM: WearingIrish NYC 2018 is a signature program that will provide priceless benefits to the 10 designers and the overall fashion community in Ireland. Rest assured that I’ve more programs in the works to evangelize Irish fashion designers. Follow WearingIrish on social media to stay current. This entry was posted in Interviews and tagged Aine, Alison Conneely, Blaithin Ennis, De Bruir, Inner Island, Interview, Ireland, Jennifer Rothwell, Margaret Molloy, Nathalie B. Coleman, NYC, Sands and Hall, The Tweed Project, Triona, Wearing Irish. Bookmark the permalink.